Generous natural light. Refreshingly air spaces. 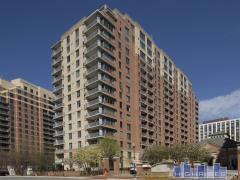 Just two of the many characteristics of this gorgeous brick high rise in DC’s desirable Penn Quarter neighborhood. You’ll feel relaxed and at home when living at 555 Mass – whether you’re enjoying a dip in the building’s large rooftop pool, burning off Saturday night’s pizza in the on-site fitness center, entertaining guests in the building’s party room, or soaking in sunsets and sweeping city views from the rooftop lounge (or your very own private balcony). Common areas at 555 Mass come complete with Wi-Fi access, a library with E-lounge, and front desk staff who are friendly and always ready to welcome you home. In-unit and in-building conveniences include gas appliances, washer/dryer connections, car parking options (both surface and garage), and, best of all, an instant connection to unique restaurants, shops, and museums. Fresh noodles at Chinatown Express, a Wizards game at the Verizon Center, Spanish tapas at Jaleos, new art exhibits at the Smithsonian National Portrait Gallery, the Penn Quarter Farmer’s Market, the shops at CityCenterDC – there’s no excuse not to have something to do living here. Have any comments or questions about 555 Mass Ave? Ask your question and/or share your thoughts about this Building. I really like this apartment to buy it..which iT is status at the market now.. It is available?